WARNING: Inspect the drive belt only when the engine is stopped. Check that the drive belt auto-tensioner indicator is within the possible use range. When new drive belt is installed, the drive belt auto-tensioner indicator should be within the new drive belt range. Check the drive belt auto-tensioner indicator when the engine is cold. 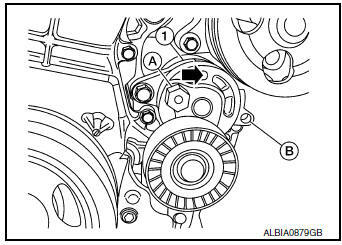 If the drive belt auto-tensioner indicator is out of the possible use range or belt is damaged, replace drive belt. Belt tension is not manually adjustable. It is automatically adjusted by the drive belt auto-tensioner. Remove wheel and tire (RH) using a power tool. Remove engine under cover. Refer to EXT-37, "ENGINE UNDER COVER : Removal and Installation"
Securely hold the hexagonal part (A) of drive belt auto-tensioner (1) using suitable tool, and move in the direction of arrow (loosening direction of tensioner). Insert a rod approximately 6 mm (0.24 in) in diameter through the rear of the drive belt auto-tensioner into retaining boss (B) to lock drive belt auto-tensioner pulley. WARNING: Avoid placing hand in a location where pinching may occur if the holding tool accidentally comes off. NOTE: Leave drive belt auto-tensioner pulley arm locked until drive belt is installed again. Loosen drive belt from drive belt auto-tensioner and then remove it from the other pulleys. Install the drive belt onto all of the pulleys except for the drive belt auto-tensioner. Then install the drive belt onto drive belt auto-tensioner last. Confirm belts are completely set on the pulleys. Check for engine oil and engine coolant. Be sure they are not adhered to the drive belt and each pulley groove. Release the drive belt auto-tensioner and apply tension to drive belt. Turn crankshaft pulley clockwise several times to equalize tension between each pulley. Confirm the indicator is within the possible use range. Refer to EM-13, "Checking"
Install wheel and tire (RH). Refer to WT-57, "Adjustment". CAUTION: The complete drive belt auto-tensioner must be replaced as a unit, including the pulley. Remove the drive belt. Refer to EM-13, "Removal and Installation". Remove the drive belt auto-tensioner. CAUTION: Install the drive belt auto-tensioner carefully so not to damage the water pump pulley.